/Mobile - iOS & Android Apps /How Do Ios Push Notifications Work? Navigate to “Notifications > Notification Types” and turn ON the available list of options. Navigate to “Notifications > Notification Types” and turn OFF the available list of options. Go the native iOS “Settings” -> “Notifications” menu. Select MangoApps from the list, turn “On” the “Notifications Center”, and select your “Alert Style” preference. From the “MangoApps Dashboard” -> “Quick Actions” menu (top left corner) select “Snooze Push Notifications”. Select your time period preference from the list to stop receiving all push notifications. 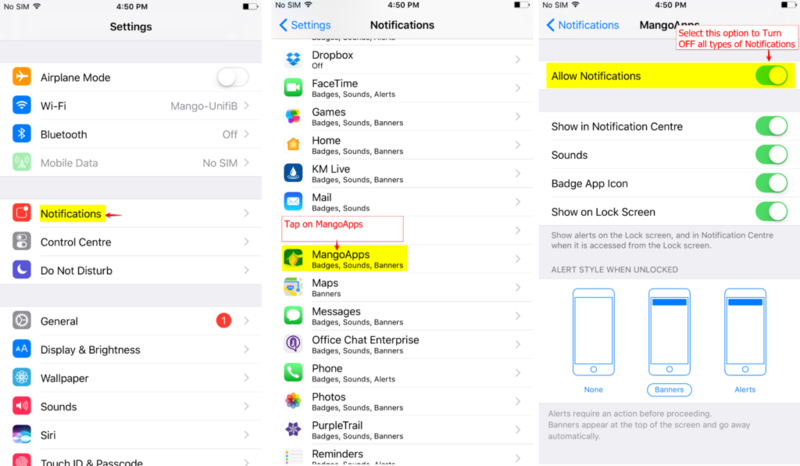 Now when MangoApps application goes in the background, you will NOT receive any feed or IM notifications over APNS for the selected time period. Now when MangoApps application goes in the background, you will NOT receive any feed or IM notifications over APNS.